Instead of downloading and printing another Tardis from Thingiverse, we’re shaking it up a bit and exploring some of the affordances unique to the 3D printer. While making our own creations is a top priority for the DML Lab, we’ve also discovered some amazingly cool items that have been captured/rendered for educational use. On the left is a skull of Homo habilis, discovered by Kamoya Kimeu (1973), and excavated by Richard and Meave Leakey. Estimated age: 1.9 million years. 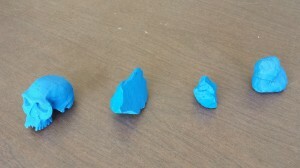 We also printed some tools (1:1) made by homo erectus from the Lake Turkana region in East Africa. Thanks to AfricanFossils.org for offering all this valuable data and 3D files to us. Also pictured on the far right is the Comet 67P/Churyumov-Gerasimenko, on which the European Space Agency landed a probe several months ago. Rosetta spacecraft launched in 2004 and arrived at Comet 67P/Churyumov-Gerasimenko on 6 August 2014. These items are fascinating. In less than two hours, we printed a tool that was had been discovered and unearthed from the historic grounds of Olduvai. And thanks to the European Spaces Agency (ESA), we discovered the data for and printed a representation of the comet scientists set out to explore over ten years ago, and some 6.4 billion kilometers travel distance from earth. 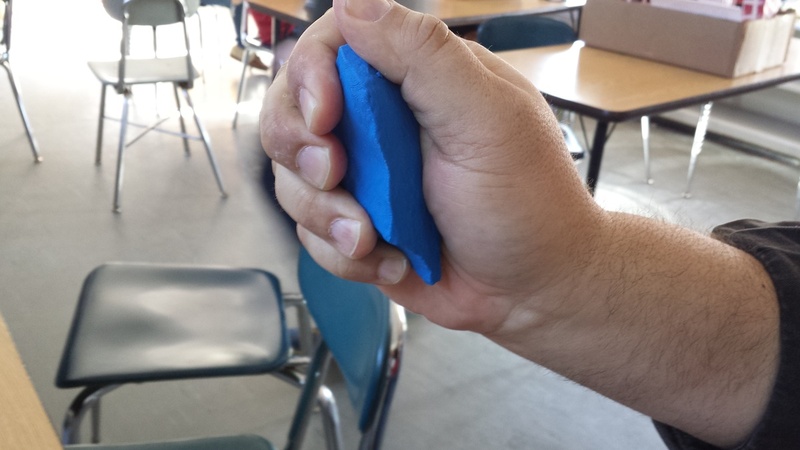 Now, in our humble DML Lab, we sit, holding a hand ax, musing and asking questions. Why is this a tool and not just a chipped piece of rock? Who was this being who made this ax? What did they do with it? And How did the ESA compute the spacecraft’s trajectory to land a probe on a moving comet? We’ve teleported objects from history and from outer space. What next? This work was helped by funding through the National Writing Project / MacArthur’s Educator Innovator initiative.